Perennial rhinitis occurs when you experience the allergic symptoms-similar to hay fever symptoms-throughout the year. It is generally triggered by indoor allergens. These include dust mites, pet hair and various moulds. Perennial rhinitis also tends to occur more often in adults than children. Dealing with the symptoms of perennial rhinitis all year can be extremely frustrating for sufferers and can hugely impact work, school and home life. Determining precisely which allergens are causing your symptoms can also require a bit more detective work in comparison with hay fever. Therefore, your first action should be to see your doctor for accurate diagnosis before working together to find a treatment plan that provides relief for your symptoms. Perennial rhinitis is treated in much the same way as hay fever. 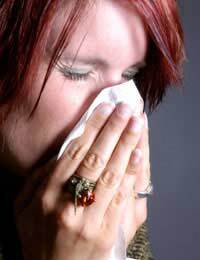 A doctor can usually provide testing to help pinpoint the particular allergens. Avoiding the allergen is generally the priority and medications can help to treat symptoms that occur after exposure. Pets and mould often trigger perennial rhinitis; thus, it's important to vacuum and dust regularly. Try to also limit the areas in your house where pets can roam and if you're looking to purchase a new pet, consider a non-shedding animal. Other helpful tips include changing bedding frequently and having pets groomed on a regular basis. Many people often find that wood floors are easier to vacuum and clean in comparison with carpets that trap allergens. Medications commonly used to treat perennial rhinitis include antihistamines, anti-inflammatory drugs and decongestants. You will have the options of tablets, nasal sprays or eye drops. The nasal sprays tend to work best at their source while tablets are usually ideal for treating a range of perennial rhinitis symptoms. Treatment may be ongoing for many years although with time, you may find that symptoms ease and your allergic response decreases. Preventative methods can also provide enough relief for some people that medications aren't necessary. It's important that you do treat perennial rhinitis, because if symptoms continue, they are likely to become progressively worse and you may experience complications. Hay fever can be challenging enough to deal with but perennial rhinitis sufferers have the added challenge of addressing symptoms year-round. Fortunately, there are many options available to prevent and treat the condition. It's important that you see your doctor to first determine which allergens are triggering your symptoms. Together, you can develop a preventative treatment plan that works best for you.